PotPlayer is a freeware multimedia software from the author of The KMPlayer, it supports for all modern video and audio formats with a built DXVA video codecs. It’s a improved version of KMPlayer, including ffdshow and some other stuff. PotPlayer is equipped with modern design, easy to configure, has the ability to assign and change the hot keys to record the playback sound in the file, connect the DSP plug-ins to display subtitles, which include visualization when playing audio files. 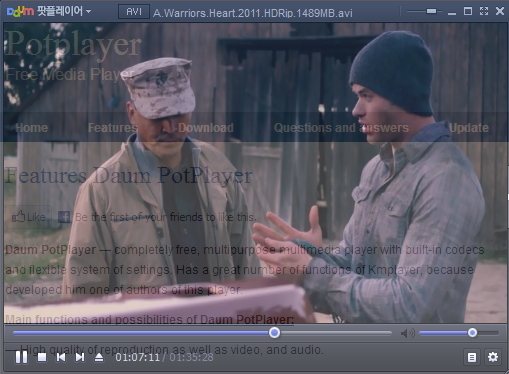 Daum PotPlayer is a modern and stylish design, and easy to manage settings. The program has the ability to change and assign new hotkeys,to connect DSP plug-ins, frame-accurate to take off skrinshoty videofiles,to write down a reproduced sound in the separate file, to include and disconnect visualization when playing audiofiles, to show subtitles,to change the design (skins). This record player has a great number of functions and tuning which considerably improve quality of video.